Today I walked with a beat in my step, the meeting for the Western Diabetes Association ended and even though it was terribly cold outside and getting dark, I put in my ipod earphones and began smiling as I looked ahead at a bright future. I walked home thinking how much my life has changed since that very day I was told I have type 1 diabetes. I couldn't help but smile, and think of how grateful I was to be given such amazing opportunities in my life. 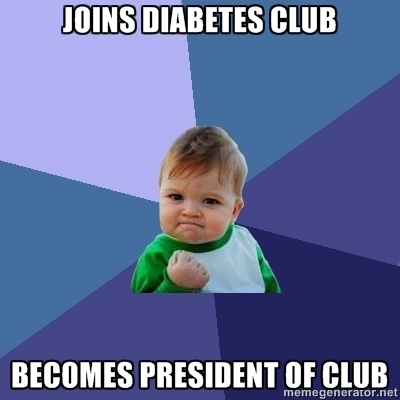 How did I get so lucky to be diabetic? Does anyone say that, but me? So what went on at this meeting that made me skip down the sidewalk listening to "Fine by Me" by Andy Grammer. Well, hinting at the blog post name and picture I am sure you've guessed it, but just in case - I was elected president by the Western Diabetes Association for the year of 2012/2013. I will admit, this was one thing I was super nervous about not achieving. I never get nervous, speaking in front of hundreds of people, yet just the thought of not getting this position made made me think I would feel like I was doing something wrong for people not to notice that I could make this club amazing. I stood in front and without pouring my complete heart out knowing that I was president already, I really wanted to make sure they knew they could count on me. I am beyond ecstatic about what I can do with this club and where it can take me and the many other members. We all are so incredibly lucky to be given such opportunities in life and be able to do what we want and take what we want from them. More than ever I have realized that it is really important to be patient and never give up. If you believe that you can do something than chances are you're going to reach that goal, you just need to be patient with yourself and others and everything will work out. If you have positive people around you and a positive reflection of yourself - nothing is unattainable! You, Me and ... My Pump?